This past week I was contacted out of the blue by someone who’d newly returned to Seattle, found an old post of mine here on the blog, and wanted to meet to learn more about the history of transit and land use in the city and how she could help make things better. It reminded me that there are tens of thousands of people moving to the Puget Sound region right now and many of them immediately get curious about our transit system, how it came to be, and why the city is built and designed the way it is. 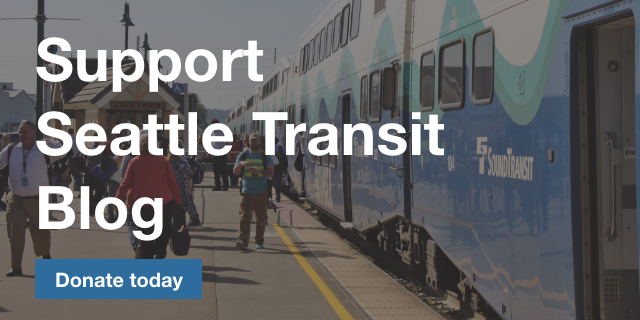 They find their way to STB, where we try to tell the story of Seattle transit and give the context for why things are the way they are and how they could be better We don’t try to be the first to report on a transit story, but we do try to be the best. We strive to show the real impact of transit and land use decisions on every day lives, and to cover what actually matters in the fast-changing world of urban mobility. Thanks to the support of our readers, the past few years we’ve been able to open a paid staff position to augment our volunteers and improve our coverage. We’ve been very happy with he results and are proud to welcome our third staff reporter, Peter Johnson. With your support, we intend to continue this work for years to come. Today we’re kicking off our annual fundraising campaign. Each year hundreds of donors have stepped up with a generous one-time donation or a monthly subscription to support our work. While advertising does contribute to our bottom line, it is the donations from the small percentage of our readers who provide the lion’s share of our operating budget. This year we hope you’ll consider joining them. In the next year, we will have more than enough to keep us busy: scoping and analysis for the next round of Link extensions, a new SDOT director, the fate of the Move Seattle Levy and the Streetcar, and much more. If your contribution has lapsed, now is a great time to start up again. We have lots to do! Hi UV, sorry you’re having trouble. Are you an existing PayPal customer? You should be able to choose a different payment method in your Wallet or when you get to the “choose a way to pay” screen. I’d be more than happy to troubleshoot with you via email. frank@seattletransitblog.com. Thanks; got it to work! Can I get a mug? Steve makes a good point. How about some STB swag?